According to CBDMT, the Market and business intelligence company, two kinds of biomanufacturing CMOs exist in Europe: 73% "Multipurpose" CMOs and 27% "AB-only" CMOs for custom monoclonal and polyclonal antibody manufacturing.166 contract biomanufacturing Organizations were identified in the European biomanufacturing market accounting for 229 production sites located in Europe. 49% of Biomanufacturing CMOs are located in Western Europe. More than half of all AB-only biomanufacturers (52%) are located in UK and France. From the exponential growth of the "modern" biotechnology industry in the 1990's the creation of Contract Manufacturing Organizations (CMOs) has followed to supply the increasing needs of production capacity and cost savings. Yet at that time, only a few CMOs existed. Back then in the pharmaceutical industry, only 5% of new drug approvals by the FDA (Food and Drug Administration) were issued from biotechnology companies and in the industrial biotechnology sector most enzymes were still produced by extraction or by chemical synthesis. 166 contract biomanufacturing Organizations were identified in the European biomanufacturing market accounting for 229 production sites located in Europe. Two kinds of CMOs exist in Europe: 73% "Multipurpose" CMOs and 27% AB-only CMOs for custom monoclonal and polyclonal antibody manufacturing. 49% of Biomanufacturing CMOs are located in Western Europe. More than half of all AB-only biomanufacturers (52%) are located in UK and France. Four main expression systems are used by contract biomanufacturing organizations: microbial, mammalian, transgenic animals and plant cells. Microbial platform still comes out on top of expression system used in Contract biomanufacturing with more than 83% of utilization by Multi-P CMOs, followed by mammalian cell culture (35%). European contract biomanufacturing organizations supply 72% pharmaceutical, 45% food and 25% feed markets. 37 European CMOs (for 69 production sites) are able to supply commercial bioproducts volumes. These facilities represent 40% of the 172 multi-purpose biomanufacturing sites established in Europe. The total available volume for microbial fermentation outsourcing is about 21,600 m3 in Europe. The total European CMO's available production capacity for mammalian cells is about 359 m3. Competition in contract biomanufacturing has rapidly increased in the past few decades and has led CMOs to offer comprehensive additional services such as regulatory compliance consulting, fill & finish operations or analytical activities. There has been an emergence of alternative expressions systems. "Some biotech companies are exploring new ways in biomanufacturing by using plant cell culture or microalgae," comments Philippe Tramoy, managing partner. The global contract biomanufacturing market was estimated to be worth ~$4.2 billion in 2007 and is expected to reach ~$5.6bn in 2010. Lonza, Boehringer Ingelheim and DSM are the preferred CMOs for custom recombinant protein manufacturing. Boehringer Ingelheim, especially is producing the top-selling drug Enbrel (total sales of US$6,5bn in 2008) and betaferon (US$1,5bn in 2008). Key contract biomanufacturing organizations with sites located in Europe are Lonza, Boehringer Ingelheim, DSM Biologics, Diosynth Biotechnology, Roche, Sandoz, Biovet, Danisco, Cambrex, SAFC, and Lallemand. CBDMT - Market and Business Intelligence- is a market and business intelligence company with offices in France, Switzerland and Israel. As an advisory services company, CBDMT boosts companies to develop revenue and growth by providing business and marketing services in the life science and biotech markets (market surveys, market scouting, business development and strategic supports). If you need market and business intelligence services in the biomanufacturing CMO market, please contact us at contact@cbdmt.com. 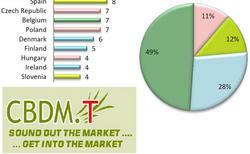 The European Contact Biomanufacturing Organizations - CbMO Market Report is available on http://www.cbdmt.com.